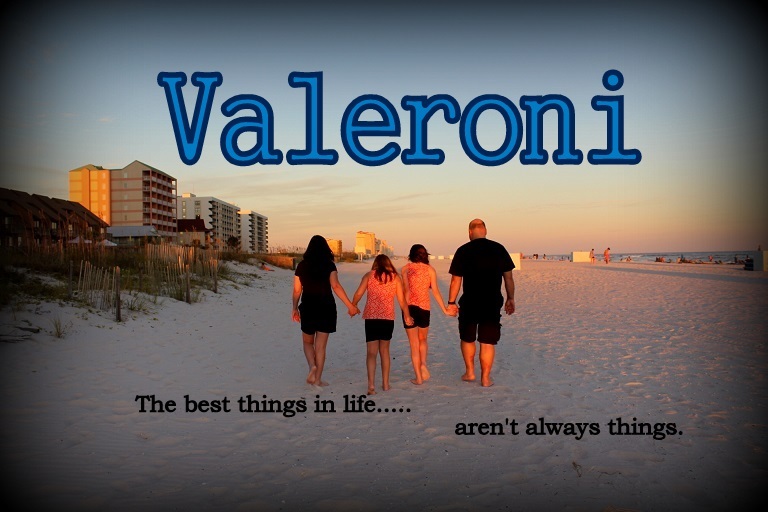 We decided to keep Valerie in school all summer. Her preschool has a 9 week summer camp session. She'll go Tuesday and Thursday -- all day! It will be a change from her half days, but I know she will love it. She is doing so well and has so much fun. I think by keeping her routine going through out the summer it will help the transition to three days a week in August. I also can't fathom having her home 7 days a week all summer long with no dancing and no school to occupy her time!! Spending an hour at the gym playroom every day wouldn't be much. Even now as 'busy' as we keep her, she still asks me where we are going or why we are staying home some days! She is definitely not a homebody!! I'm truly amazed at how many times a day someone ends up on my blog searching for a Navy Bean Soup recipe! Ten, fifteen, or twenty searches a day... from all over the world. I'm really curious if anyone ever made my Mom's recipe and how they liked it. Who knew it was so popular?? I had never known anyone besides my Mom who made it. I remember being very young and staying with my Grandma for a little while. I guess I was 3 or 4. I haven't a clue where my Mom was. I have a vivid memory of my Grandma "calling" the Easter Bunny. Not because I was bad, but to let him know that I was at her house. I hid ever so timidly and watched as my Grandma whispered into her black rotary phone. I was amazed that my Grandma knew the Easter Bunny's phone number!! My Mom came to get me and as we left, I found a boiled egg in a flowerpot by the steps!! The Easter Bunny had come! The tradition carried over at home. As Easter neared, I'd find boiled eggs in the planters by the front porch. These were colored eggs though. I guess Grandma didn't want to bother with that!! Usually they'd still be warm as if he had just left it. As I got a little older, my best friend and I came up with the idea that maybe if we left a carrot out, it would lure the Easter Bunny to leave a surprise. I think maybe I grew some carrots just for this very purpose. Sometimes we'd make a 'nest' out of grass and leave the carrot in it. We'd watch out the window for a while, then we'd move on to playing and forget, but only temporarily! As soon as we'd remember to go check - sure enough that Easter Bunny had come through!! Sometimes I'd leave a carrot out before leaving for school but I wouldn't tell my Mom about it to see if the Easter Bunny was real. shhhhhh!! And I'd still find a candy or an egg when I got home, so that meant something, right?? It seems I can recall a few times that the Bunny left candy I didn't like - coconut or something with nuts. It was always something my MOM liked, so I guess the joke was on us!! And now it's our turn. Last year Valerie had a ball with it. I'd hide a treat by the front door and talk her into going check the mail. Val would be so excited, so I'd pretend to look waaaaay down the street and see the Easter Bunny hopping around the corner. Val would yell as loud as she could, "Thank you Easter Bunny!!" He's only come once so far this year. I, er the Easter Bunny, needs to do a little Easter shopping!! Clint came home last night! Yay! The kids were so excited waiting for Daddy. We had birthday gifts for him and a cake. He turned the big 4-1 on Tuesday, so they were waiting to celebrate with Daddy. Clint somehow managed to sneak off an hour early so he'd be home before dark! All was going well..... until it was 7pm and he wasn't home yet. Then the phone rang, and I knew something had happened. Clint says, "You're never going to believe this...."
About 2 miles from the road to our house on Hwy 90, "something" hit the car. Clint was behind another car, and whatever it was went under the other car and hit Clint's. It was so fast Clint has no idea what it was. It hit pretty hard.... flattened the front driver's side tire, then hit the back and flattened that tire too. AND it was hard enough to bend the rims. What was it?? We don't know! He said it was pretty big. Big enough to have flipped the car. Or he could have lost control and had a bad accident. Traveling 70mph+ and having something hit like that is pretty dangerous! * Thankfully none of that happened! He was able to regain control well enough to pull over and call for help. Of course he had to wait for the state police to come for an incident report. The call for a tow truck since the tires and rims were busted. It looks like the rims will have to be ordered, so we are down to one vehicle for a while. Luckily my Dad has 3 vehicles so we can always borrow one of his if need be. But Clint is home safe and sound. The car can be fixed. We have the means to fix it. As always... things could have been much worse. *Shame on those of you who are making jokes about an accident. You wouldn't like it if it happened to your husband... oh wait, never mind. I received a package today. It was from a 'stranger.' Someone I have spent hours upon hours chatting with online. Years and years. Sure, we talked on the phone. Exchanged a few things by mail. But we have never actually 'met' and will probably never ever meet face to face. We have been out of touch off and on over the past few years. Just the occasional "hi, how are things going?" What was in my package? It was a memento of my Mom. A beautifully framed poem surrounded by pictures of her. I knew what it was when I saw the box. He had told me about it last week. After I opened it, I didn't think I would ever stop crying. For my Mom, of course. I miss her so and it hurts so much still. I was in awe that someone I have never met made such a great effort. Took the time time and money to make this for me. Basically a stranger. Yet my Mom's death was ignored by so many.... When I was completely overwhelmed with grief, many fell silent. A stranger can do all of this, but yet those I know are "too busy" (and I quote) to send a simple email? If I sound angry... I still am. I will never look at these people in the same way again. I wish I could cut all ties... and I just might. I am just blown away at the kindness found in the most unexpected places. I guess it makes up for it. I am very touched that someone took the time to send me such a lovely gift. Many thanks.... you know who you are. It was another beautiful sunny day here in Bayou Blue, Louisiana. And of course it was another day of outside fun. My Dad even came to visit so we got two Poppi days in a row! We played in the backyard for a while, then moved to the front. The girls were digging in some boxes of my old toys in the garage and uncovered a relic! It's almost shocking to think just how old this thing really is because that makes me older! I also have another house, a pool, a car, and lots of furniture boxed up as well. Saving those for a rainy day, and this was a snap to put together. Those won't be! The kids had a great time with it. Then... During a break I was checking Freecycle and had a reply to a message I sent yesterday. Somebody was giving away a fully furnished doll house. I replied right away, but didn't get a response so I figured I was too late. Today she emailed and said the first two takers didn't show, so it was mine if I wanted it. Of course! So we piled in the car and drove across town to pick it up. She threw in a tea set to boot. Not that we need any more toys, but it was free and it is new to them at least until the novelty wears off! The "relic" was quickly forgotten. Val and Roni played with this house non-stop for three solid hours. I couldn't even get them in to eat, so I served dinner outside next to the doll house. I had to drag Veronica in kicking and screaming when it was bath time. Even then, she put her hands on the glass of my doors crying and crying... No, I'm not bringing it inside! Thankfully we are all back to normal health wise! The weather has been just perfect the past few days. Gorgeous spring weather. Of course the kids have been itching to spend every waking moment outside. Which we have practically.... I don't mind but it does make it next to impossible to get any housework done!! We've been swinging, playing in the dirt, playing with bubbles, kite flying, picnicking, looking at clouds, drawing with chalk, Easter egg hunting, going for wagon rides.... I love making happy memories with my Girls. Today we spent the entire day at my Dad's house. We got there about 10am and didn't come home until 5:30!! And again, we spent all day out enjoying the beautiful sunshine. I sorted through a little more stuff and threw out more trash. I guess every little bit helps, but we still have a long, long ways to go. You'd think Val and Roni would be exhausted after all the playing, but No!! I keep hoping they will go to bed and stay asleep.... but No! Nights are such a struggle. Veronica especially has been having really rough nights. Nothing seems to work, so I'm giving cry it out a shot in hopes she'll give it up after a few nights of no one rushing in. I'm exhausted. Clint is back at work. The 7 days he is home sure is nice. But I am not liking the 7 days he is away. Valerie is sick now. Fever, vomiting, and diarrhea. She was sick for a few hours yesterday, napped, then woke up perfectly FINE. She does that a lot when sick, so it's really hard for me to judge just how sick she is. Was it a passing thing? Or is she really sick?? Today she's a little off, so no school to be safe. I'm not feeling so hot either. Veronica is doing MUCH better thankfully. She's so little so I was worried. I'm questioning if she had pneumonia and maybe it was just a stomach bug after all. Especially since I'm feeling queasy myself. Valerie is having the same stomach symptoms and the same listless behavior. We saw a different doctor when I brought Roni in (new to the office) and I wasn't too impressed. Mainly, she answered her cell phone in the middle of our follow up visit. It buzzed in her pocket, she looked at it then answered. Then she kinda mouthed "She's wonderful... keep giving her the medicine... follow up as needed." And went about her phone call. Handed me the chart and almost pushed me out of the door. Umm ok?? I don't think I will be seeing her again unless I have to. Then of course I have no medical training, so what do I know?? Hopefully we're on the mend now. I knew Veronica was sick. Very sick. But I had no idea.... About 3:00 she had this major fit. She was looking SO bad. So listless. I called the doctor's office to make an appointment for tomorrow and amazingly got an appointment today at 3:45. My poor baby. Hopefully we caught it early enough, but I have to keep a close watch on her. We go back at 8:30am tomorrow for a follow up. Poor Veronica has a nasty virus. Monday night Valerie had dancing, and I knew something was wrong. I was able to stay for the entire hour of class!! Veronica *never* lets me stay in the waiting room. She is usually all over the place, talking, yelling, etc. so I have to leave. Not Monday. She literally laid across my lap the entire hour. Once we came home, she was in bed by 7:30. Again, another red flag since bedtime is always a struggle. Yesterday I had to wake her to take Valerie to school. Veronica felt warm, so I dosed her with Tylenol and we headed out. Went to Wal-Mart, then the gym, and Roni had the saddest look on her face the whole time! Yesterday afternoon her fever spiked even higher and the puke fest began. She didn't act really sick though. We played outside as usual and she was her normal self. I put her to bed about 8:30 and hoped for an uneventful night. ha ha! She had other things in mind. About 10pm, she woke screaming and thrashing about. I took her out of her bed and moved her to the pack n play in our room. I put on Yo Gabba Gabba for her. She still cried and cried. Poor darling was so sleepy and was crying in her sleep. She was burning up. I tried everything to comfort her and calm her down! I don't know what was bothering her - stomach? throat? ears?? She was trembling and sweating in my arms. Finally about midnight I gave up and gave her a little Benadryl hoping it would settle her down. I guess it worked because by 1:30am she was asleep and didn't wake up until 6am with another round of you know what. So far today she is doing much better. No sleep for Mommy last night makes for a cranky Mommy today!! Thankfully Clint is coming home tonight, so he will be here to help out. Now who wants to wager on who gets it next?? Or I should say first... Me or Val? Sure would be nice to lose 5 lbs, but not that way. Veronica is two years old today. It seems like she was just a tiny (cranky) newborn and now here she is an official toddler! Where has the time gone? I still find myself calling her "the baby" although obviously she is no baby! She's the sweetest little girl when she wants to be. Full of hugs and kisses for us and her baby dolls. How she loves her dolls - rocking them, holding them, and changing them. Can't forget she's full of silly antics that keep us laughing too!! There isn't much she doesn't eat either. Some days I wonder where she is putting all the food she packs away. Happy Birthday to my sweetheart, Veronica Leigh!! We are so proud of you! Mommy loves you very much. Sometimes I wish there were a quick, easy way to heal a broken heart. Just when I feel like I'm finally moving around the bend, something comes along and knocks me back into a corner. I just miss her so much. More than anyone can ever imagine. How sweet is this... Veronica singing Happy Birthday to herself!